Berries, berries and more berries, in all stages -- these blooms will be ripe berries in one month. What a beautiful day to be picking strawberries! The peach trees are now in full bloom. The "boss" checking peach blooms for freeze damage -- only minor loss. Our small wildflower patch is beginning to show color. In early February, the strawberry plants were healthy and growing. The older leaves had been stripped off these plants. The sandbags are out ready to hold down the frost covers on freezing nights. The plants to the left still had all the leaves they had grown since planting in October. The older or dead leaves on the plants to the right had been stripped off. The first strawberries of the season! These little green berries that were forming in the blooms around February 10th should be big, lush, red, ripe berries ready to be picked starting about March 16th. Carlos and Manuel have been very busy since late January trying to get all the peach trees pruned before they begin to bloom in mid-March. Here are a few photos from strawberry planting time in mid-October, 2007. 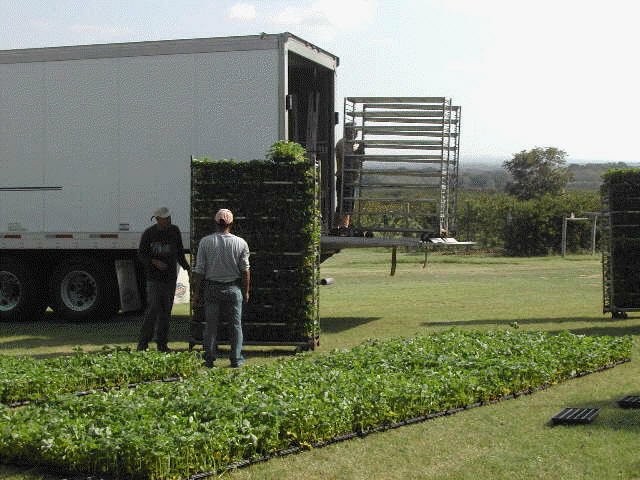 Unloading 13,000 plants from Virginia. Marburger Orchard staff, & good friends/customers helped us plant. Planting crew ready to plant another row! Completed field -- plants getting established in preparation for next Spring's crop!